This is so difficult you may not even want to try. The gift of a spaetzle-maker, originally intended for the giver’s daughter – “Honestly, you’re more likely to use it.” – has plagued me for years. It sat in the cupboard leering, challenging me to finally take it from it’s simple, clear plastic wrapping and make a batch of the quickly simmered soup dumplings. For some reason, however, making doughs, an activity involving things like measuring and specific ingredients, always seems so foreboding, a challenge best left to classically trained pastry chefs and German grandmothers. Last week, the need to dress up my recipe for asparagus soup drove me to research spaetzle. Custards felt fussy, and a garnish of wild mushrooms just lazy. Mushroom spaetzle, though daunting, seemed the perfect solution. We carefully measured each ingredient only to discover that sweet, light Oyster mushrooms disappeared in the rich dough. We pressed on, sautéing hearty, bold Criminis for a second batch. They were delicious and we were in love. So, was it worth the painstaking pain and suffering? Should spaetzle be left to the chefs? The answer is “no.” Made with four ingredients, simmered and served, spaeetzle couldn’t be simpler. Guten appetit! Chop mushrooms and parsley together until minced. Bring a large pot of water to a simmer. Meanwhile, whisk together flour and salt. Add mushrooms and whisk to combine. In a separate bowl, whisk together eggs and milk. Add to dry ingredients and whisk until it forms into a smooth dough. Press dough through a colander, or spaetzle-maker, over simmering water. Cook for 2-3 minutes and drain. Serve with butter or over soup. Snap tough ends from asparagus. Add ends to a 4 qt saucepan with stock, thyme, bay and parsley stems. Simmer for 20 minutes. Melt butter in a soup pot over medium-low heat. Simmer potatoes and leeks in butter. Add a little water as needed. Cook until potatoes are soft. Strain stock into soup pot and cook for five minutes. Cut remaining asparagus into 2” pieces and add to stock. Remove 10-12 tips after 3 minutes. When asparagus is just tender, pass soup through a food mill or processor. Stir through parsley. Season to taste with salt, pepper, butter and vinegar. 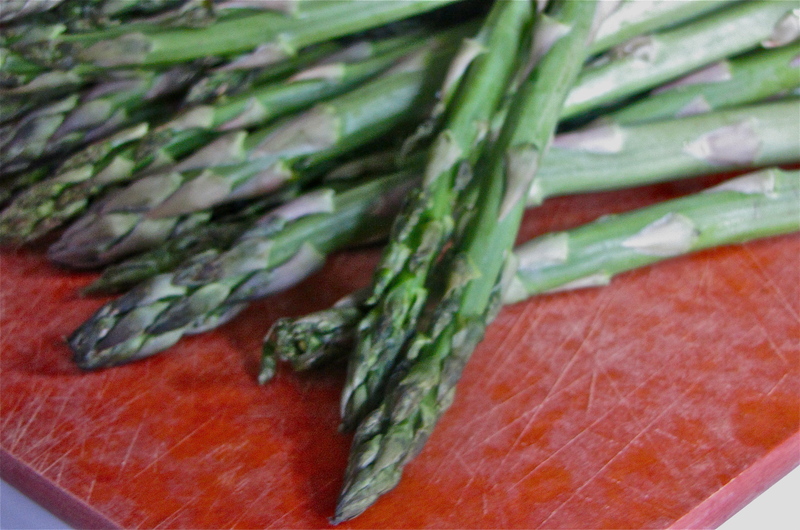 Garnish with asparagus tips. Gardeners, cooks and farmers share a unique awareness of the changing of the seasons. Crocus and radishes give way to irises and asparagus. Early summers pinks, blues, English peas and sweet cherries change to late summer yellows and oranges, summer squash, sweet corn and tomatoes. The seasons are changing right now. Farmers at the Market admonish us to enjoy the spring’s last rhubarb and asparagus, while filling the gap with the year’s first tomatoes and squash, helped along with early season cover. They taste richly of the soil they’re grown in, but not yet sweet from the summer sun. Seasons of eating start with hunger, built over months of waiting. That first spear of asparagus or first ripe tomato is wonderful eaten raw and fresh. Over a six to eight week season your recipes progress from old favorites to new experiments. Finally, when you think you can’t eat another zucchini or ear of corn, they are gone until next year. Here, then is a celebration of the passing of asparagus. It’s been a wonderful spring for it, although May’s heat led many farmers to end their harvest earlier than usual. Enjoy this salad, simple and fresh, elegant enough for fine dining, quick enough for a Tuesday supper. Until next year. The name of this salad refers to the similarity in appearance between the grated egg and the foamy yellow/white flowers of the Mimosa tree. 3/4 cup Olive oil – the good stuff! *Another treat from Sapore Oil and Vinegar in DC. You can substitute champagne or a tarragon,white wine vinegar. Begin vinaigrette: whisk together shallot, vinegar,mustard, and a pinch of salt and pepper. Peel and finely grate the hardboiled eggs. Set aside. You won’t be able to get the entire egg grated. Pop the larger, leftover pieces in your mouth. For a special presentation, line up your asparagus spears and cut them to fit the plates you will be serving this salad on. Blanch asparagus in a large boiling pot of salted water for approximately 3 minutes, until crisp tender. Shock in an ice bath. Complete vinaigrette by whisking in olive oil in a thin stream. 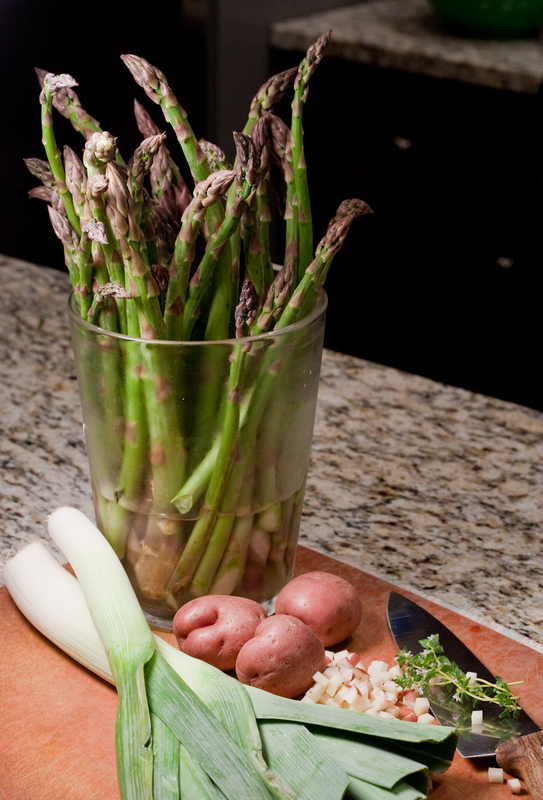 Taste vinaigrette with an asparagus stalk and season to taste with additional salt pepper, oil or vinegar. 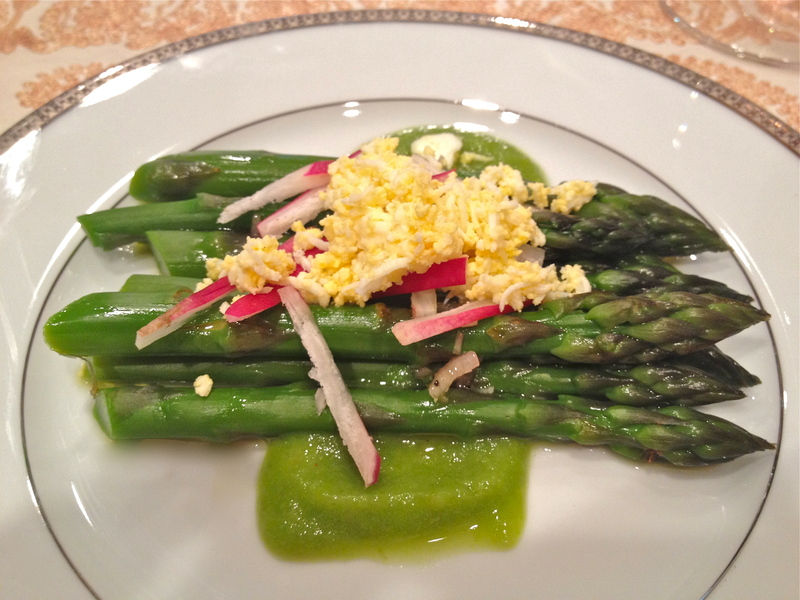 Place asparagus stalks on individual plates, drizzle with vinaigrette, top with radish and egg. *Thomas Keller takes the tender ends of the asparagus, left over when you trim the spears to the size of your salad plates, and blanches them for about five minutes. Shock them in an ice bath, then puree them in a blender with a few tablespoons of the cooking liquid, salt, pepper and a drizzle of olive oil. That’s the green sauce you see on the bottom in the photograph. At the time I was reading Jennifer McLagan’s cookbook, Fat. Extolling the virtues of good butter, she recommended doing a tasting. So off we marched, Jason and I, into the kitchen, with a block of local, farm-fresh butter in one hand and a stick of grocery store butter in the other. One at a time, we cut a small sliver of each and let them melt on our tongues. The first thing you notice about farm-fresh butter is the rich taste of cream. Then you notice the season and diet of the cows. In spring the butter is herbal and floral, light and perfect against grassy spring vegetables – asparagus, spring onions, fiddleheads and radishes. In summer the butter turns grassy, pairing perfectly with zucchini and tomatoes. In fall and winter when the cows switch to a feed diet, the flavor is rich and mellow, perfect for pumpkin, beets and holiday baking. The grocery store butter was nearly flavorless. Softening on your tongue it gave the feel of greasy fat with the taste of cardboard. When cooking from scratch you’ve got six, maybe ten, ingredients in a dish (that’s if you count salt and pepper). You can’t afford to have one of those tasting like cardboard, and not pulling its weight. That’s the butter story. Every word of it is real and true. Every week I bring home a block of butter from Dan at Agora Farms from his stand at Eastern Market. I finish soups with a tablespoon or two for added richness. I’ll whisk a tablespoon into the deglazed pan juices of a sautéed chicken breast or bone-in pork chop to make a quick sauce. This coming weekend, as part of my weekly cooking demo, I’m making Hollandaise. 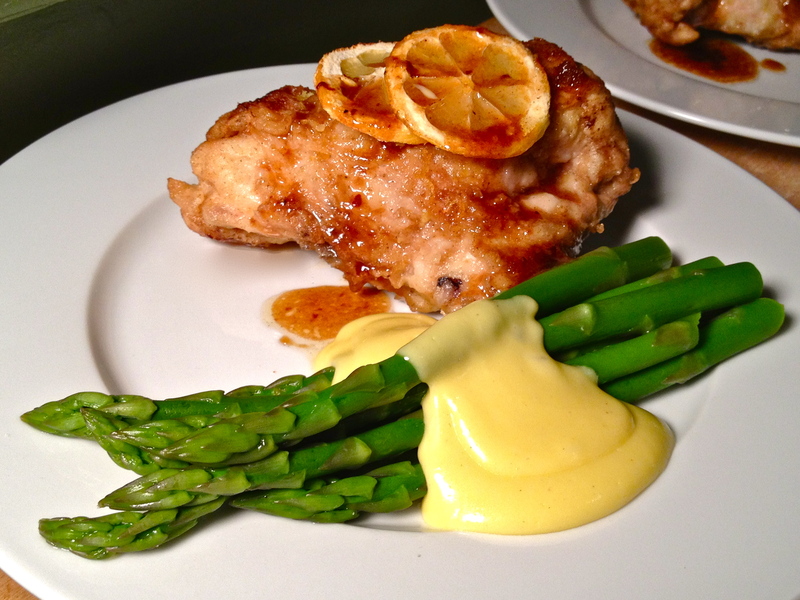 It has four ingredients – water, egg yolks, clarified butter and lemon juice (plus salt and white pepper). Strawberries and rhubarb are in season and I’ll make a pie next weekend as well. The dough contains flour, water, a pinch each of salt and sugar, and butter. In each case the butter is on stage, exposed, and it had better be good. Good butter – good ingredients – matter. And they matter greatly. They also cost more. Prioritize good food. Cut out something small this week and treat yourself to a pound of incredible, farm-fresh, Amish butter this weekend. Or local asparagus, really exceptional olive oil, or strawberries that will travel less than 50 miles from the field to your shortcakes. Good food is worth it. And so are you, your friends and your family. A bowl full of spring. Cream soups always seem institutional, the purview of cans and dining halls. At their best, they are comforting carb and fat bombs, warming us on cold, wet days. But cream soups have never been an expression of the Socratic ideal of their centerpiece, be it broccoli, mushrooms or asparagus. 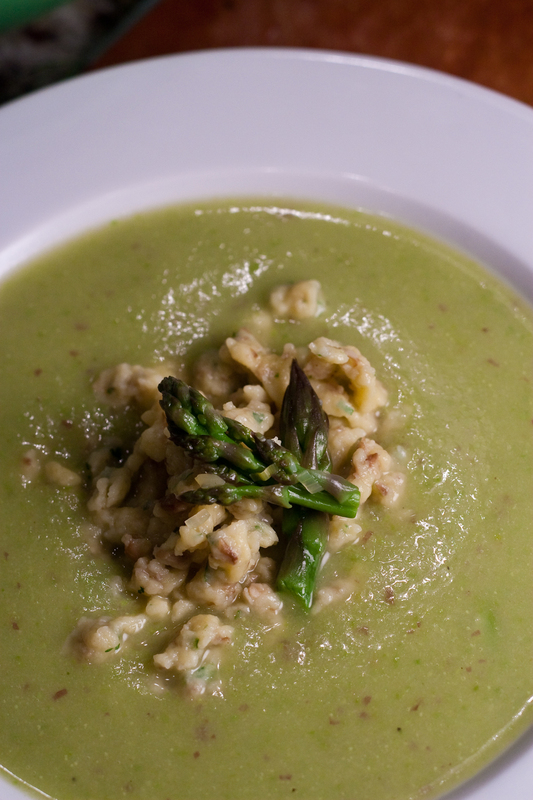 When I first started working with Alice Waters’ asparagus soup recipe, it was a revelation. Potatoes and onions, not cream or flour, thicken the soup, delivering heartiness without dulling the flavor. 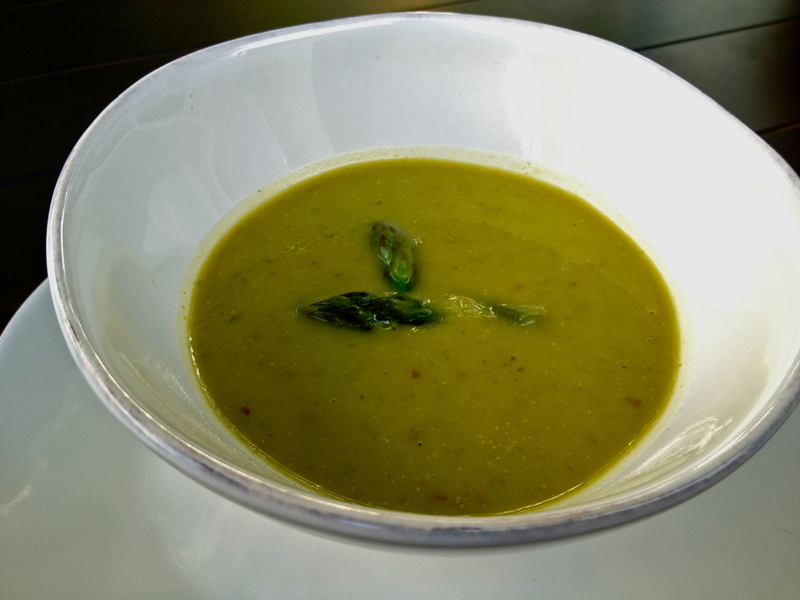 The flavor of spring’s fresh asparagus is brought front and center by first simmering the tough ends of the stalks in stock and then cooking the tender ends of the asparagus for as short a time as possible, 5-7 minutes, before running the soup through a food mill or processing it with an immersion blender. Two pounds of asparagus seems like a lot, but after all, this is asparagus soup and you want that to be the primary flavor. 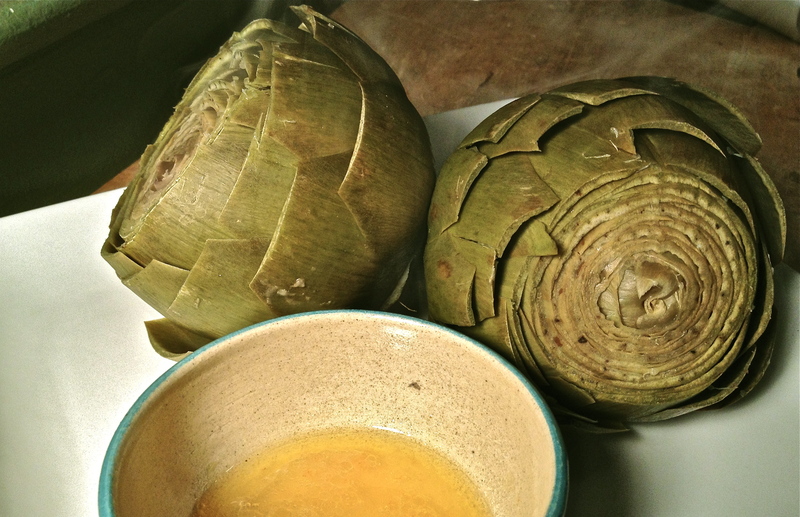 Over time I’ve learned that the soup almost always benefits from a tablespoon or two of rich, farm-fresh butter for richness and a splash of sherry vinegar to brighten the vegetables. Spoil yourself with a dollop of crème fraîche. Snap tough ends from asparagus. Add to a 4 qt saucepan with stock, thyme, bay and parsley stems. Simmer for 20 minutes. Melt butter in a soup pot over medium-low heat. Simmer potatoes and leeks in butter without browning. Add a little water as needed. Cook until potatoes are soft. Strain stock into soup pot and cook for five minutes. Cut asparagus into 2” pieces and add to stock. Remove 10-12 tips after 3 minutes. When asparagus is just tender – no more than 5-7 minutes total – pass soup through a food mill* or processor. Stir through parsley. Season to taste with salt, pepper, butter and vinegar. Garnish with asparagus tips and fresh parsley. 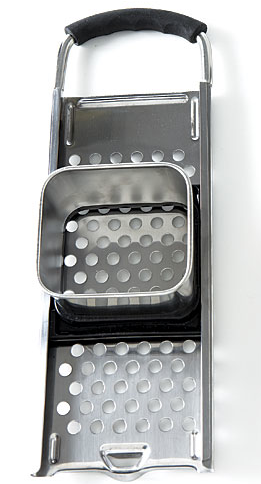 *If you use a food mill, you will end up with a smoother soup, but some of the fibrous asparagus will be left behind. Add the stock back in a little at a time until you achieve the desired thickness.